"Astronaut Kanai, together with astronauts from NASA, the European Space Agency (ESA) and the Russian cosmonaut, participated in the CAVES mission organized by the ESA. CAVES is a training course which aims to promote the self-management and cooperation ability required for a long duration stay in space. Kanai and the other four participants co-habited for six days in darkness, with no clue to the passage of time without the sun. 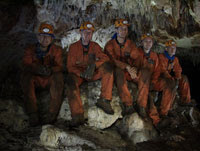 During the training course, they accomplished tasks just like those of the astronauts on the ISS, communicated with the support team outside the cave twice a day, checked the status and upcoming plans, updated a map of the caves, took photographs, and obtained samples for Geology and Microbiology."